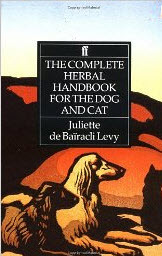 My introduction to Juliette de Bairacli Levy was when I was researching for my thesis on herbal medicine for dogs. Her name kept coming up again and again, apparently for good reason. Born Nov 11, 1912, she grew up with her mother, father and three sisters, as well as a nanny, chauffeur, maid and gardener. Educated at Lowther College, she went on to study veterinary medicine at the Universities of Manchester and Liverpool for two years. Becoming dissatisfied with what they were teaching in veterinary medicine, she traveled around the world learning from various people, especially Gypsies, farriers, and peasants, how to care for and treat animals naturally. When her book The Complete Herbal Handbook for Farm and Stable was published in 1951 it was considered the first work of it’s kind ever published, such knowledge having previously been passed down through word of mouth. Juliette was also famous for her award winning naturally raised Turkuman Afghan Hounds. Her cure for distemper? Fasting and “generous use of antiseptic herbs”, as well as isolation from other dogs. Done early enough, she says there should be no complications, other than perhaps discharge from eyes and nose, cough, diarrhea, and some fever, with the overall condition resolving in about three weeks. Unless the animal has been inbred, of weak stock, or has been vaccinated recently, in which case there may be complications that include nervous disorders, paralysis, meningitis, chronic diarrhea and much more. In the 1940s she studied with Edmond Bordeaux Szekely, a Hungarian doctor, where she learned the importance of going beyond treating just the symptoms of disease. Juliette had two children, Luz and Rafik who were born in the early 1950s. She and her children raised owls, hawks, dogs, goats, donkeys and bees in Israel. After that she moved to Greece, where she continued to write (including poems and stories) and gather herbal knowledge. In her latter years she travelled every summer to America where she gave lectures and workshops about herbal medicine. In 1998 Frontier Herbs presented her with a Lifetime Achievement Award for her contribution to the herbal world. Juliette died May 28, 2009 in her sleep in her home in Switzerland. She was 96 years old. To learn more about Juliette de Bairacli Levy and her natural rearing methods check out this and other books written by her. There was some really interesting information in there. The blog was nicely written. I especially like the point about treating the problem rather than the symptoms. That is really important or the problem will not go away. certainly like your web-site but you need to take a look at the spelling on quite a few of your posts. Several of them are rife with spelling problems and I to find it very troublesome to tell the truth however I will surely come again again.